Couponing alone was not the only thing that got us out of huge debt and helped us through periods of unemployment. We also learned How to Save Money Every Day. We made big changes in how we approached our spending. Our biggest change was to really take a look at what we had and appreciate those things instead of constantly seeking out new items to buy. I was embarrassed at how often (pre-couponing days) I made impulse purchases based on wants. Along with that big change, we have made many lifestyle changes that have saved us so much money over the last 6 years. We still implement all of these things (and more) even though we are now debt free and have more wiggle room in our budget. 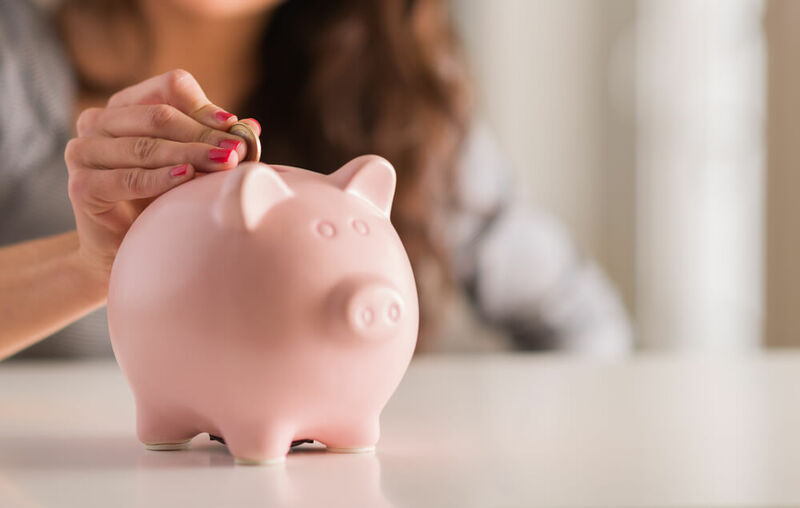 When I sat down to write this list with my husband, I was surprised at how much we do now to save compared to our free spending days that got us into debt. For instance, I never blinked an eye at picking up lunch, stopping for coffee every day, hiring people to repair things in the house, etc. I shake my head now thinking how wasteful these things were. Don’t get me wrong, we have times when we buy lunch and coffee and we have had to hire repair people. These days, though, that is not the norm. I hope this list sheds some light into our more frugal lifestyle. You may be doing some or all of these right now. Or maybe it will encourage you to rethink some of things you are doing to help put more money in your own pocket. Save here and there so you have room to afford the things that are important to you. That to me is Living Rich With Coupons! I find that when I try to wing it and remember what I need, I buy things I don’t need. Don’t you hate it when you come home with a bag of peppers only to find you have a bunch in your produce draw already? I like to keep an ongoing list on my phone so I know what I have to pick up to avoid over buying. Invest in some nice travel mugs so you can make your coffee at home. At an average of $4 a cup, you can save over $1,000 a year. And, that is based on just buying one cup, five days a week for the year. Buying lunch just 3 times a week at a cost of around $10 per lunch, is a savings of over $1500 a year. Wow! It’s no secret that produce in season is much less expensive. For instance, buying cherries in the winter vs. the summer is a huge savings. Stock up and freeze items like red peppers priced at $0.99 in season vs $3.99 out of season. Usually on a given day I have to stop at a store, gas station, dog groomer or even just going into the office. I try to plan my stops to coordinate together to save on gas. No sense saving money with coupons only to blow it with wasting gas on out of the way trips. Checking clearance sales has just become habit to me. I know where all the clearance sections are in any of the stores I frequent. At my grocery store (ShopRite) I know where they keep the managers special meats, reduced produce, etc. When I head into Target, the clearance sections are one of the first places I check. Some times I come up empty and some times I hit the jackpot. It’s always fun to see what I can find. Using up items in your frig is a great way to save. Once a week, try to make dinner based on just the items that are leftover or going to go bad shortly. Have peppers that are getting too soft? Cook them up with your favorite chicken dish to get them used up. This is actually my husbands domain. He loves checking for discounts on our utilities, insurance and more. You never know if there are discounts to be found until you look or ask. So save money on utilites guys! I am a big Marshalls girl. Love.That.Place. So many great bargains. I also like shopping the outlet stores but you have to be careful there. Not everything is a great deal. Case in point, I went to Saks Off Fifth at the outlets and bought a cute orange top (my favorite color). The price was $24.99. A week later, I was in Marshalls and they had the exact same top in blue for $14.99. I love thrift shops as well but there aren’t any nice ones by my house. No we don’t have electric cars or hybrids but I do own a Mini Cooper that gets awesome gas mileage. 11. Shut off lights when exiting rooms. Confession: My husband actually shuts the lights off after me because I have a bad habit of leaving them on. 12. Find ways to reuse/repurpose items in the house instead of buying expensive alternatives. If you follow me on Instagram you know I make a conscious effort to find ways to reuse or repurpose items in my house instead of buying something that I need or wanted. Something that comes to mind is using mason jars I already had for utensil holders for a buffet. A pretty jar with a broken lid becomes a holder for make up brushes. A plain dresser for a boys room turns into a dresser for a girls room by just changing or spray painting the draw pulls. 13. Keep the house clean and organized so you can easily find items and not have to re-buy them. I know that seems so logical but I sometimes have a habit of not keeping up with certain areas of my house. For instance, I would buy gifts ahead of time at great prices but forget where I put them because I didn’t have one area set aside just for gifts. Or greeting cards that I bought for a great price would get buried in a draw. Having specific areas for things like these and immediately putting your items into their place helps when the time comes to use them instead of running out last minute to buy a gift or a card and paying full price. When I was a young wife with young kids, I found the need to make these big elaborate meals. It became stressful when the kids activities starting taking over our lives. That was the time I found myself buying take out food a lot. Now, I make my meals simple and quick. Preparing and freezing meals ahead of time is also a great idea. This is just a given as dry cleaning costs are crazy…especially women’s clothing. French manicures no more! The cost of those was too much to keep up with as was the time it took to sit there and have them done. Now, I just head to the salon when there is a special occasion. This has been a big adjustment for me. I was the queen of the impulse purchases. No more! Big purchases require at least a week of price checking and mulling over. Small purchases like clothing usually require a final look over before I buy them. It’s amazing how much I put back when I take a second look and analyze what I’m buying. 20. Be happy with the things you have. This sort of goes along with #17, never make an impulse purchase. One of the criteria for deciding on buying something big or small is to remember what I already have. Sometimes it even allows me to use something in a different way I hadn’t thought about instead of buying something new. Recently I was in a store and they had these adorable market baskets for sale. I had one in my hand ready to buy it. I pictured myself using it to carry the fruit and veggies I had picked from my garden. Then I remembered I had these cute white baskets I had gotten from IKEA for $1.99 that I could use. Saved myself $24.99! 21. Compare prices while in the store using the Amazon app. If you haven’t downloaded the Amazon app yet you should. It’s an awesome way to save money on the spot. Recently we were in Home Depot and we remembered we needed a replacement filter for our frig. I scanned the barcode with the Amazon app and found them $5 cheaper on Amazon. Bought them online right there in the store. Remember, most stores will price match as well. I happen to have many years experience as a drapery workroom seamstress so I know how to sew. But, it’s easier then you think, especially now-a-days with YouTube. Watch a few how to videos and you’ll be surprised what you can do. Watching free movies is just one of the many reason I love Amazon Prime. This is actually another task my husband takes on. He is diligent about scheduling maintenance for our air conditioner, furnace, cars, etc. Spending a little money on these services helps to avoid large repairs later. Every month my husband and I sit down to reevaluate our budget. We look through what we actually spent, how much we have leftover, how much, if any, we may have pulled from emergency funds. We watch our progress on long term savings and discuss any larger purchases we need or want and how to plan for them. There are never any financial surprises! Umm hello?!? I should have made this #1! Take a look at our coupon database for an easy way to search for coupons! We moved to a new home 6 years ago and I never realized that, in my old neighborhood, I had all my favorite stores set up by prices of products. It took me a year in our new neighborhood to find those favorites again. Now, I know I can head to Best Market or Aldi for great produce prices. I have a Marshalls (thank goodness) for great prices on clothes and also gluten free and more gourmet food products and I have a Costco close by that I use for some of our organic/gluten free purchases. Make sure to shop around and find the stores in your area with the best prices on the products you buy often. This would be another one of the reasons I love Amazon Prime. 29. Do repairs around the house instead of paying a professional. While we are always getting great deals on paper towels, it’s rare that we can get them for free. To extend the life of those great deals on paper towels, I also use cloth towels all the time! Those are my 30 tips I do on a daily basis to save money! If you start implementing just 10 of these things you will see a difference!